48 x 36 in. / 121.9 x 91.4 cm. 42 x 36 in. / 106.7 x 91.4 cm. 48 x 60 cm. / 121.9 x 152.4 cm. Karen Marston is a painter focused on the fundamental contradiction of natural phenomena, the pairing of powerful terror with majestic beauty. 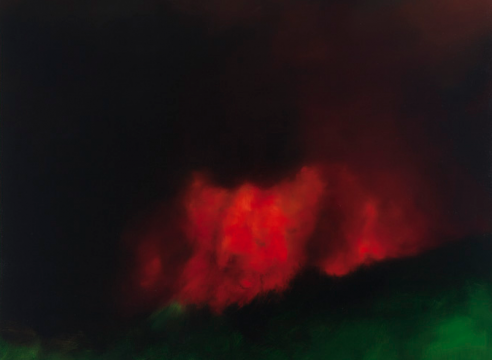 Her large-scale oil paintings portray this strength at its extremes: tornadoes, forest fires, hurricanes, volcanic eruptions. While many of these events have occurred naturally throughout the history of the Earth, they have also been exacerbated by the influence humans have on the environment. The exhibition’s title Demeter’s Wrath comes from the Ancient Greek Tale of Erysichthon. In the myth, King Erysichthon seeks to quickly expand his palace. He enters a wooded grove sacred to the goddess Demeter, the Earth-Mother figure who also controls harvests and grains, and therefore the earth cycle of life and death. In his selfish haste, Erysichthon callously cuts down Demeter’s favorite tree. Irate, the goddess punishes him with a curse that brings him eternal starvation. The king is overwhelmed by his own hunger, and though he constantly eats larger and larger amounts of food, his body continues to wither and weaken. Finally, when no food is left in his kingdom, he turns to eating his own body. The king’s greed and disregard for nature push him to consume even himself. This ancient story holds direct parallels to many of the modern ills that Karen Marston addresses in her work. Man’s disregard of the warnings of climate scientists is hastening the damage we do, not only to the environment, but also to ourselves in consequence. Many news stories on climate change take on a personal narrative, such as animal extinction, property damage and famine. Marston, however, focuses on the way these effects are funneled through nature itself. The scale of nature in her work is so large and powerful that humans are not seen directly in it. At times we might see the artifacts of human existence (such as an oil rig, or telephone pole) but the people have already run away from, or been consumed by, the forces she depicts. In Eruption (2015) we see a volcano’s dark and dense pyroclastic flow choking the atmosphere itself. However, the blurry sense of dread it arouses in us is matched by the pure beauty of the smoke’s indiscriminate power. Volcanic eruptions destroy, but they also create some of the most fertile soils. A central component of Marston’s work is the idea that these elements gain much of their power and ferocity from being in motion. In Volcano Lightning (2015) we see this in full effect, as the motions of subterranean forces rise up and engage the havoc they create in the sky. By pairing Ring of Fire (2016) with Ablaze (2016), a sense of time’s duration is created as a forest fire swells to full inferno. Once again, we are reminded that the destructive power of fire is an awesome visage, but also a part of the Earth’s regenerative process. At other times, however, Nature’s force seems to bring us only destruction. Tornado #9 (2015) threatens the viewer with an approaching cyclone that devours all in it’s path. Crashing Waves (2015) hurls the full weight of the ocean down on the coastal towns and cities we have, perhaps foolishly, erected on our shores. In assessing the damage of these events, we tend to refer to them as Acts of God. While the beauty of these forces is truly something to behold, Marston subtly hints that they can also be Acts of Man. The cycles of Nature are old and profound. Karen Marston depicts them with the awe they deserve.